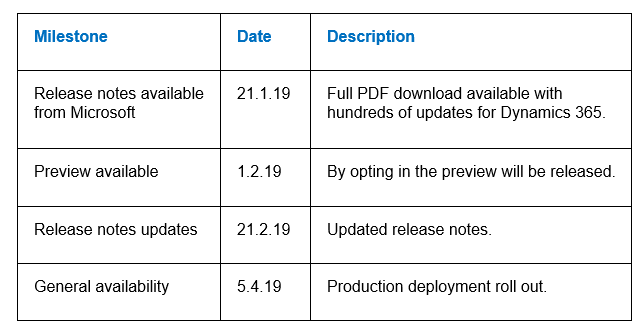 Microsoft has provided release notes for the updates that will be rolled out from April 2019 for Microsoft Dynamics 365. There are hundreds of new features across all apps, Sales, Customer Service, Marketing, Portals and more, and Microsoft is also adding a new experience using “Microsoft Layout” and “Microsoft Remote Assist” as well as Artificial Intelligence (AI) capabilities. Before I delve into some of the highlights from the Microsoft Dynamics 365 April 2019 release notes, I wanted to mention some other changes Microsoft has made when they are rolling out new functionality which was announced last December. Microsoft is altering the way that new features and functionality is received. As CRM consultants this is great news for bespoke sites to ensure that the system is stable and can also start to review the new functionality early to find out if it is something that will help with their business challenges. From February 2019 the features that will arrive in the April 2019 update can be previewed. I am sure that some of our clients and many users of Dynamics 365 for customer engagement will want to opt-in to the preview feature updates, and Caltech will also be opting in and spending time reviewing the features ahead of the release as well. The preview features can be reviewed in a production, trial or sandbox environment however we do recommend that you consider the implications of where the preview features will be applied. Please speak with Danny Kendall your Account Manager for advice if you are looking to opt-in and we can help. What I love about the new release notes is the way they are laid out. Microsoft has designed them to solve business challenges and they focus on digital transformation. The easy to view guide discusses the why. Why is the new feature available. It then provides business value and then a short sentence to confirm who the new feature may help before giving information about what the feature will do. There is a team element that is already available in Dynamics 365 customer engagement, where people can be listed as a team to receive alerts and so on. The new team functionality derives from Microsoft Teams which is the social workspace that provides a hub for team-work. Why – to help close sales. According to a McKinsey report, salespeople discuss a potential sale with their colleagues on average 16 times. This new social function is designed to modernize the way in which teams are interacting today. Other new features being delivered as part of the Microsoft Dynamics 365 for Sales April 2019 update include quoting, more data intelligence and social selling. What’s due for release in April 2019 Dynamics 365 for Customer Service? Really exciting new functionality is being released to the customer service application. Not all features will suit every customer but there is some great leaps with live chat, portals, better reporting on cases and feedback. Other great features to mention include more features released to Microsoft Dynamics 365 for marketing, improved mobile device sign in using email addresses instead of server URLs and a streamlined Power Apps experience. At Caltech, we will be reviewing the new features from the 1st February 2019. For Caltech’s clients, Danny Kendall your account manager will be providing updates and we will plan a webinar for our Online clients before mid-March. Are you a Microsoft Online user looking for help or support? Caltech can help. Contact us today for a competitive quote. This entry was posted in Microsoft Dynamics 365, Microsoft Dynamics CRM Features and News, Uncategorized by Catherine. Bookmark the permalink.